I often make life more complicated than it has to be. We have been in a busy season for some time now – nights have been long, weekends have been a blur – and as I assess the busyness, I realize that most of it is stuff for which we volunteered. But I must tell you that much of the busyness has included newly-opened doors, unexpected opportunities, and blessings that couldn’t have been harvested from the comfort of my living room couch. I could have settled for less stress and the occasional nap, but I would have missed out on bushels of blessings in the end. In Genesis 49, we see the life of Reuben, the firstborn son of Jacob by his first wife Leah, summed up in just a few sentences. And sadly, there’s no denying that Reuben missed out on much. The words are spoken by a dying Jacob, as he prophesies over his twelve sons. His assessment of Reuben starts strong. After all, Reuben is his firstborn – an automatic place of honor in Jewish culture – and the son of Jacob’s youth. But Reuben is a crushing disappointment. The words “unstable as water” must have felt like a gut-punch to Jacob’s eldest, and the reminder of his sin with Bilhah (his father’s fourth wife and the mother of two of his brothers) must have left him drenched with regret (Genesis 49:3-4). Reuben is surprisingly relatable to us today. He doesn’t strike me as a mean, malicious guy or a conniver. But he was mediocre, lukewarm, weak in character, and “unstable as water”. A slave to his own desires and emotions, Reuben would forfeit his full potential. Instead, he would simply settle for far less than God’s best. Reuben’s affair with Bilhah was sandwiched between the deaths of Jacob’s beloved Rachel and his father Isaac (Genesis 35:16-29). The sting of his moral failure was no doubt punctuated by that timing – it was like kicking Jacob while he was down, and it was an unspeakable dishonor to the entire family. As a result, Reuben lacks the credibility to save Joseph from his treacherous brothers in Genesis 37. As the eldest, he should have commanded enough respect to stop his brothers in their tracks. But having traded his influence for indulgence, the most he can do is buy Joseph a little time, until Judah convinces the brothers to sell Joseph, rather than kill him (Verses 21-30). And as Jacob predicted, Reuben would “not excel”. He loses his double portion as the firstborn to Joseph’s sons, Ephraim and Manasseh (Genesis 48:5, Proverbs 13:22, Matthew 1). The Messiah will be born through the line of Judah – not Reuben (Genesis 49:10). And more than 400 years later, the tribe of Reuben will settle for a watered-down inheritance, choosing to stay east of the Jordan River (Numbers 32), rather than taking a portion of God’s designated Promised Land. And that brings me to my point. In the context of free will, we have the prerogative to settle (Joshua 24:15, Galatians 6:7-9). We have the God-given authority to be okay with a lazy, underdeveloped faith, while we exercise our “liberty” to be less than God intended (Galatians 5:1, 13). God will grieve our choice, but He will not undermine it. We can choose to be ruled by our emotions, our instabilities, and the fleeting pleasures of this world, and in that compromised state, we can forego our full potential in Christ. But I’m not okay with that. Today and every day, I want to keep going back to the cross. I want to chase down God’s will, the way that He chased me down when I was lost. I want to live forgiven, restored, and with a purpose beyond anything this world has to offer (Psalm 16:11, Isaiah 61:7, Matthew 6:20, II Corinthians 4:17-18, Ephesians 1:18, 2:10). I want to keep asking Him to search me, letting Him dredge up the dark corners in my heart until He accomplishes all that He intended (Psalm 139:23-24, Philippians 1:6, 2:12-13, Hebrews 12:1-3). And by His grace, until I reach my home in heaven, I choose to be blessedly, and most-decidedly, unsettled. Is there an area of your life where you have settled for less than God’s best? Are you allowing some unchecked sin to rob you of what God has for you? 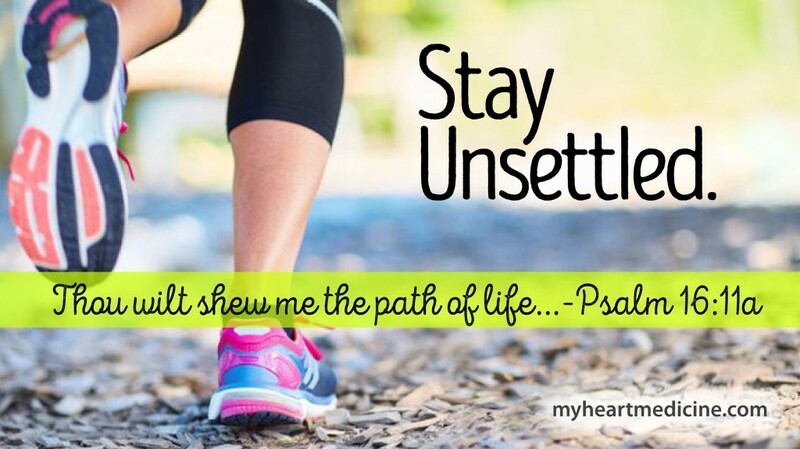 If so, ask God to unsettle you and to help you to turn away from the sin that is holding you back.